Some photos taken during the wake of Captain Jessup Bahinting at St. Peter's Chapel in Cebu City. Bahinting died in a place crash off Masbate, together with DILG Secretary Jesse Robredo and Nepalese co-pilot Kshitiz Chand. Estimated 4,000 relatives friend and student from aviator pilot school attended the burial of capt. Jessup Bahinting. 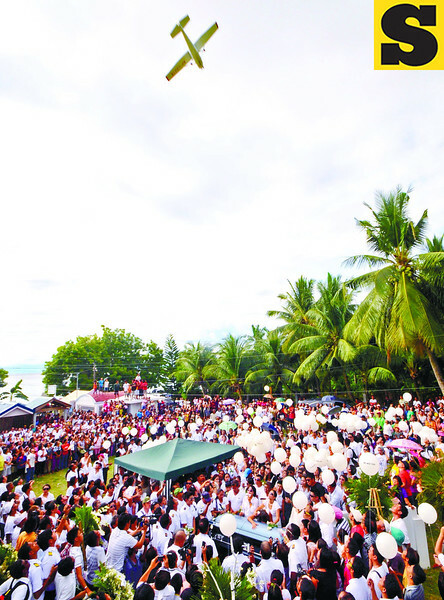 white balloons release in the air after his dead body laid to rest at the private cemetery in the town of Ginatilan. An airplane dives a the burial site.